I had lost sight of the first stone cairns almost immediately, as I stumbled down to the dry river wash at the bottom of the ravine. (“Water is scarce,” the printout helpfully noted.) After a few false leads, I made it to Peek-a-Boo Canyon, whose hard-to-spot entrance was surrounded by what looked like a shallow pool: I took a step in and sank straight up to my thighs in thick mud. As the sun continued to climb in the sky, I wished for my own Ute guide — or at least a GPS tracking system. 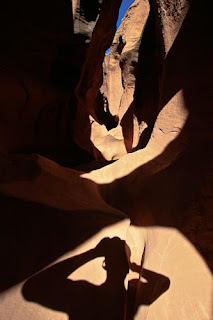 Hugging the canyon wall for shade, I pressed on heroically and found Spooky Canyon, named for its otherworldly atmosphere. It was only an 18-inch-wide crack in the rock, but to me it yawned like the gateway to Shangri-La. As I squeezed inside, the air was immediately cool and fragrant. The sky appeared to be an electric blue sliver far above, and the reflected light made the golden sandstone seem to glow from within. I remained utterly still, in a lizardlike state, knowing that I couldn’t hide in there forever. Finally, I drank the last of my water and staggered across the rock like a sun-struck character out of “The Good, the Bad and the Ugly.” I was parched, scratched, encrusted with mud — but triumphant. Well, the esteemed proprietor of Anatreptic.com, Mick Stockinger, and I and my brother-in-law strolled down to Peek-a-Boo Canyon and Spooky Gulch a while ago. It's great but we missed the dramatics. It really is tempting to scoff at the Manhattan pantywaist, but the truth is that the difference between a stroll in the park and a scary adventure is very little. A wrong turn, a twisted ankle, disorientation, demoralisation, dark - and that's just Central Park let alone the wildest part of the contiguous USA. Another difference tho is experience. There's a discreet gap between hiking and mountaineering apart from technique. Mountaineering is much tougher physically and calls for judgement under stress as well as a likelihood of spending nights in a bivouac. So on a trek, however tough, a mountaineer tends to be confident that he has something in hand. That can lead to comic mistakes of course. "Hey I thought you brought the compass." There's an obvious political moral here, but I'll let that lie. In the US, the power of the political blog was transformed when Matt Drudge made Monica Lewinsky the most famous intern in White House history, and nearly brought about the impeachment of a president, by publishing his sensational story on the Drudge Report. Why did Mr Staines not follow his example? Perhaps he would like to tell us. Perhaps I will eventually. Not to the Telegraph though. Your paper has behaved reprehensibly. To breach a confidence, reveal a source, tip off Downing Street and break a signed non-disclosure agreement is hardly honourable. The bitterness you and Pierce demonstrate is manifest to all your readers. Claiming today that the Telegraph discovered that Draper lunched at Chequers days after setting up the Red Rag site without attributing that "scoop" to me two days earlier is revealing. You have one of the weakest political teams around. The paper has lost its way and is reduced to taking scraps from my blog for its front page, day after day. I trust this is all a big deal in Utah. It seems positively Jacobean to me. Delicious.